In a matter of days, Comet ISON will make its perihelion approach, coming within 750,000 miles (a very close shave in astronomical terms) from the Sun. Both astronomers and the general public have gone abuzz over Comet ISON thanks to a prediction released a year ago by NASA's Jet Propulsion Laboratory (JPL) that stated that the comet could reach magnitude -11.6, or about as bright as the Full Moon. Additionally, besides being shadow-casting bright at night, the comet would be bright enough to easily be spotted during broad daylight. If this were to happen, it would not be a first, but it would allow Comet ISON to join a very exclusive list of the brightest comets ever seen. To days, only 9 comets in recorded history have been bright enough to be seen in daylight. Now, in chronological order, here they are . . . The Belgian historian Sigebertus Gemblacensis completed his Chronica in 1111. In it, he wrote that on 1106 February 2 a star appeared during the daytime, between the third and ninth hours, about a cubit from the sun. The probable universal time of this observation was February 2-3. A cubit is roughly equal to one degree, meaning that the comet was in Aquarius. The comet was observed in other European countries as well as in the Orient. Some estimates credit the comet as having a tail spanning 100 degrees at peak. Even if it weren't for its amazing show, the Great Comet of 1680 had another distinction: it was the first comet discovered by telescope. 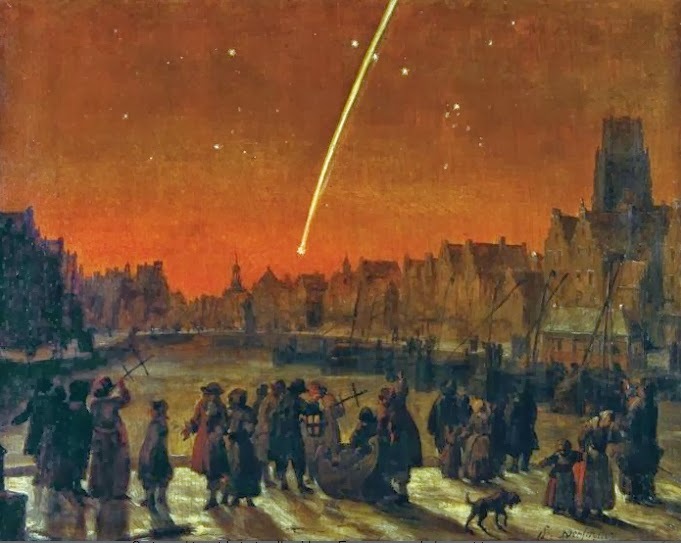 First seen on November 14, 1680, the comet rapidly brightened as it approached perihelion, which took place on December 18, 1680, at which tie the comet, which passed within 600,000 miles from the Sun, was reportedly bright enough to be seen in broad daylight. Coincidentally, the Great Comet of 1680 has an almost identical orbit to that of Comet ISON. 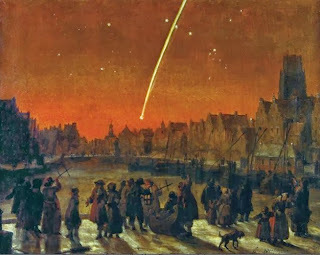 This comet was discovered simultaneously be several astronomers in November, 1743. In november, 1743, it was reported as appearing as a nebulous star without a tail. By February, 1744 it was as bright as Venus and, after perihelion approach in March, 1744, it developed a spectacular, fan-like tail with 6 prominent streaks. This 6-tailed comet was even observed before it rose, its tail was that bright. The comet then moved into the Southern hemisphere, where some observers credited it with a tail spanning 90 degrees. 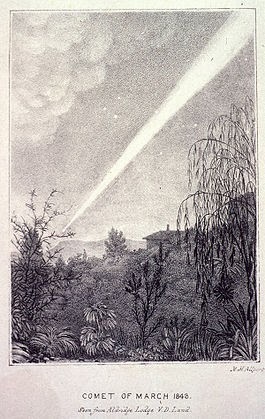 After 2006-7's McNaught, some came to believe that the Comet of 1743-4 was the first recorded appearance of a comet featuring prominent dust striae. First observed in February of 1843, the comet rapidly brightened to the point it was seen in broad daylight at perihelion, which brought it to about 1 angular degree (or about 830,000 miles) of the Sun. This comet was known for its extremely long tail. 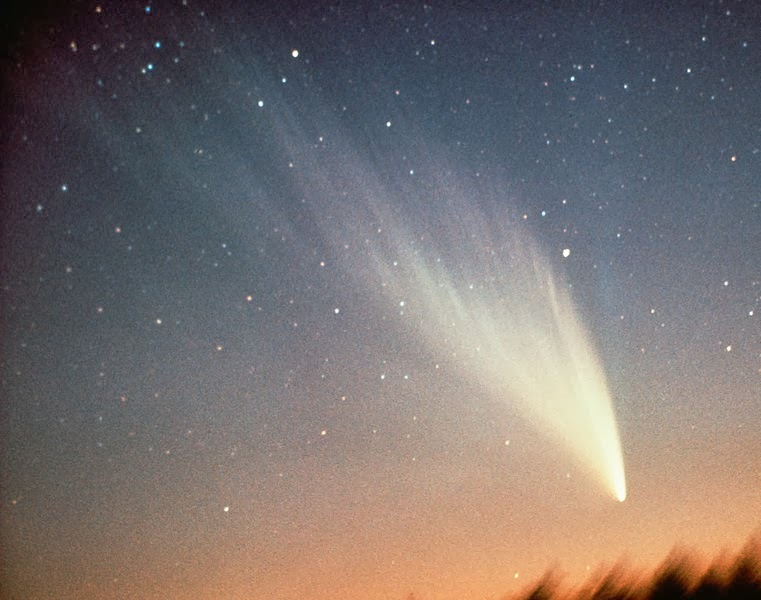 At over 2 astronomical units (over 180 million miles), the Comet of 1843 would have the longest measured tail until Comet Hyakutake of 1996 was found to have a tail of over twice that length. Great Comet of September 1882 (the Super Comet). Perhaps the brightest comet ever seen, at peak, some estimate the Great Comet of September 1882 of having had a peak brightness of magnitude -20, rivaling that of the Sun. Initially spotted in either late August or early September1882, the comet brightened rapidly as it approached perihelion, which took place on September 17. At this time, the comet was reported as being scarcely dimmer than the limb of the Sun, suggesting a magnitude as bright as -20. After perihelion, the comet quickly moved into dark skies, making it perhaps the most spectacular comet ever seen in all of recorded history. The comet remained visible to the naked eye for a long time, until February, 1883, with the last confirmed sighting coming in June, 1883. This comet was also notable in being the first great comet to have been photographed. 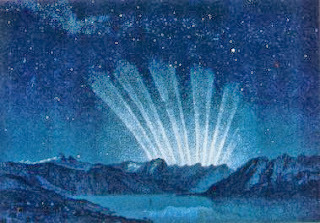 The Daylight Comet of January 1910. In 1910, comet mania was in high gear with the anticipated return of Halley's Comet set for April. However, in January, a surprise came about in the form of a comet that literally burst into naked eye visibility virtually overnight. 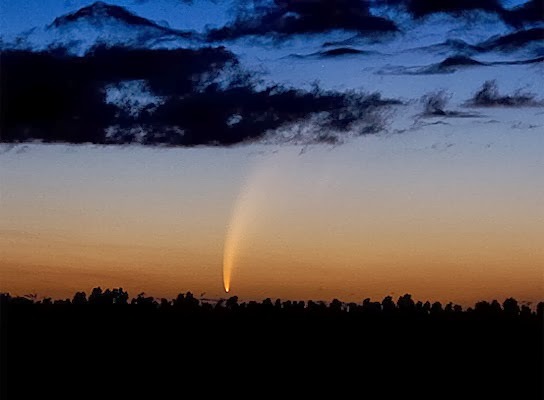 Initially observed in the Southern Hemisphere, the comet reached perihelion on January 17 and moved into the Northern Hemisphere thereafter, easily out-shining Venus and having a tail possibly 50 degrees long. 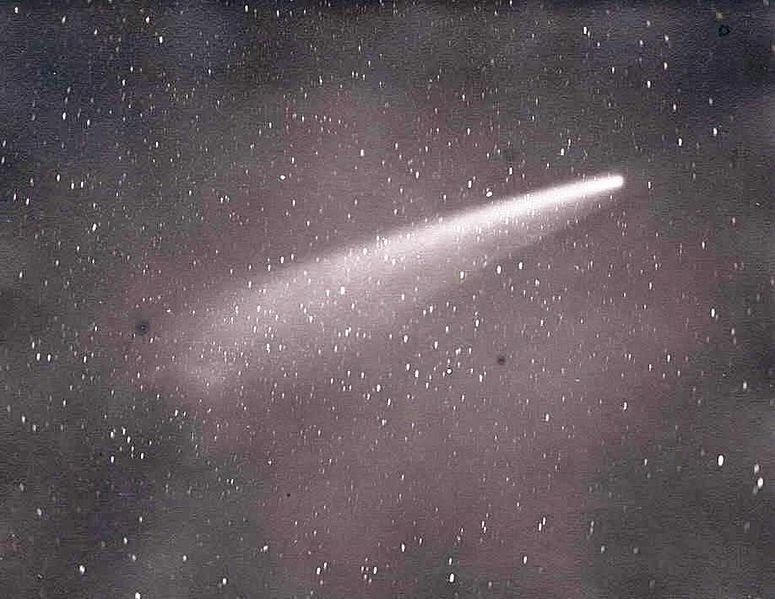 Thanks to appearances of Halley's Comet later that year and the passage of decades, many recollections of the two comets were confused when Halley's Comet reappeared in 1986, with the Daylight Comet being falsely remembered as Halley's Comet. 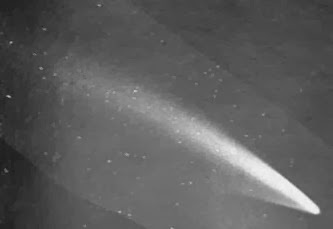 This comet became very bright in late, 1927, being naked-eye visible for about a month. In mid December, the comet, already notable for its yellow appearance thanks to a shedding of sodium atoms, shot into daylight visibility thanks to a forward scattering of light, provided one blocked the Sun with one's hand. The Comet reached perihelion on December 15 passing within 1.5 angular degrees of the Sun. Initially discovered in December, 1965, initial predictions projected a perihelion approach to within 500,000 miles of the Sun coming in mid October and the comet reaching incredible brightness. In this case, the comet lived up to the hype, reaching an apparent magnitude of -10 in October, 1965, becoming visible next to the Sun in daylight near perihelion. After the comet reappeared on the other side of the Sun following perihelion, it sported an extremely bright, long tail. Discovered photographically in September, 1975, Comet West was predicted to reach perihelion on February 25 of the following year. At perihelion, observers reported the comet as being bright enough to be seen in broad daylight. Unfortunately, despite its spectacular appearance, comet West was largely ignored by the non-astronomical media thanks to another comet, Kohoutek, which failed to live up to its initial billing as 'comet of the century' in 1973. 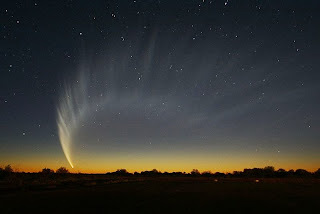 Like West, Comet McNaught was discovered photographically about 6 months prior to perihelion, which took place in mid-January, 2007. For observers, it didn't take long to realize that the new discovery was brightening rapidly and had the potential to become a 'great comet.' 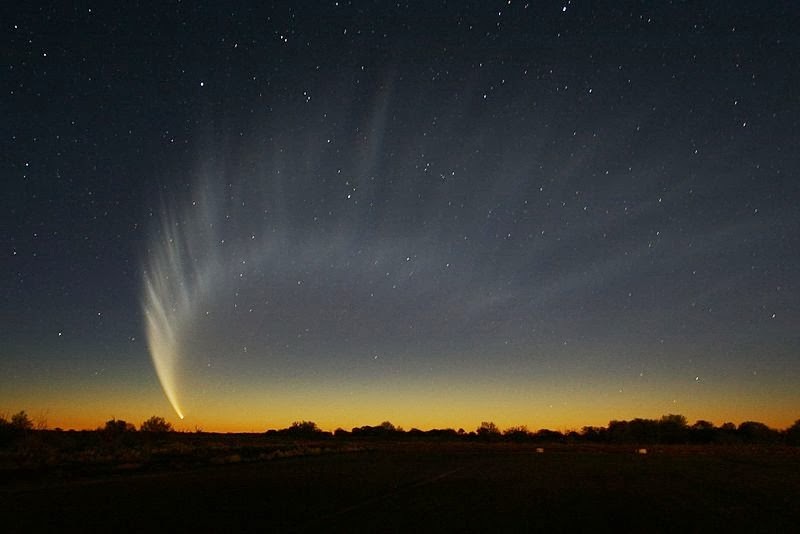 Until its perihelion approach, Comet McNaught was a Northern Hemisphere object. Even before perihelion, the comet was bright enough to be seen in daylight. Post-perihelion and after moving into the Southern Hemisphere sky, the comet sprouted a gigantic, dusty, fan-like tail, the end of which was even visible in the Northern hemisphere. In terms of measured brightness, McNaught was measured as having a brightness of -5.5, the brightest since 1965. So, will Comet ISON get added to this list? In the end, only time will tell. The good news: whatever happens to Comet ISON, we won't have long to wait as it makes its perihelion approach in a mere 2 days! Halley's Comet has put on some good shows, but it was never a daylight comet.